I noticed if you installed the xfce4-weather-plugin (0.8.9) and added it to the panel you were unable to select your location (search didn't work). and add the "Weather Update" plugin. There is a font issue with the Peppermix light themes that causes the text to appear too dark. Noticed this in 0.8.9 as well. Can't you just change the font colour .. in the preferences (as in your pic) .. I can. Just click that Black box to the right of "Select font" .. then choose your colour. 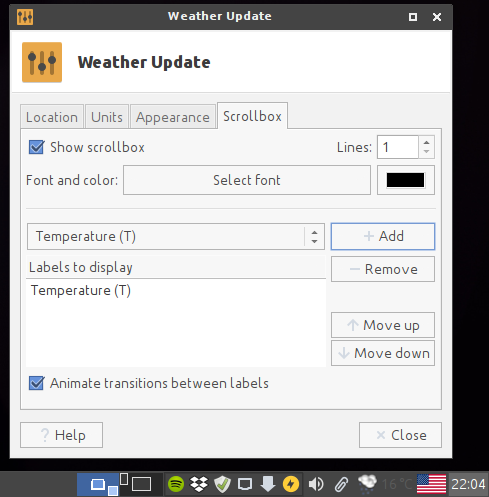 Quick question on the XFCE Weather Plugin. I have it installed and I'm wondering if there is a way to "auto click" on it for startup. So the Weather Report window will open automatically on boot. It is in the tray just fine...but have it actually open. I don't think this is possible (some panel plugins have command interfaces, but most don't) .. maybe there is a different desktop weather app someone knows about ? If you're looking for a customizable, nice looking desktop weather widget try this one. Thanks! I tried this and I like it!